This is the band that could probably be called one of the world’s biggest cult Thrash Metal bands (possibly the very biggest), without actually being a Thrash Metal band. VoiVod emerged at the same time as Thrash, share common ground with many Thrash bands, and certainly benefited greatly from the fact that an audience was growing ‘hat was willing to listen to much more extreme forms of music than before (had they emerged a few years earlier, I very much doubt there would have been a Metal audience ready to accept them). However VoiVod stand apart. While the likes of Queensryche have absorbed concept into their Metal, VoiVod have simply absorbed Metal into their concept. A concept that’s as much to do with Science Fiction, with future visions and with the band’s extremist artwork (first drawn by drummer Michel ‘Away’ Langevin, now generated by his work with computer art). Their music has more in common with Killing Joke, The Swans, Public Image Ltd or Hawkwind than with the skull and crossbones Satan. 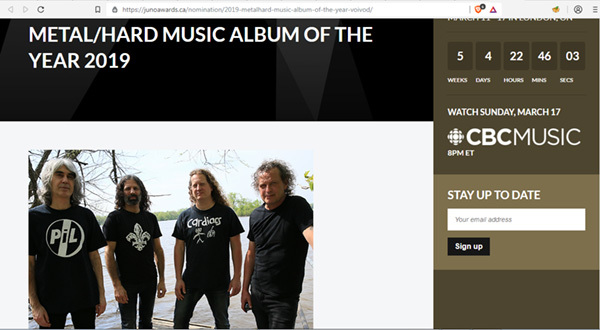 In relatively recent times the band (Dennis ‘Piggy’ D’Amour-guitar, Jean-Yves ‘Blacky’ Theriault-bass, Denis ‘Snake’ Belanger and the aforementioned ‘Away’) have braved two storms. Firstly they signed to Mechanic Records, the ‘specialist Metal’ label under the wing of MCA Records, home of Bay Area brutalists Violence and New York’s retro-rockers Dream Theater, rather than renewing their association with well known Metal indie Noise Records. Secondly, and shockingly, ‘Piggy’ experienced the unthinkable when he was diagnosed as having a cancerous tumor near his brain. Although he has made a full recovery from treatment, the band were forced into some deep contemplation about their future. If anything, they seem to have emerged strengthened in their resolve. ‘NOTHING FACE’ is the title of the fifth VoiVod album. The distortion’s been dropped, but the dischord’s still there, only now you can here more clearly the dissonant playing and experience VoiVod properly, as musicians, perhaps for the first time. The spiraling twists and waves of relentless multiple tempos are still there, only this time they’re stripped bare to draw you in all the more. The concept, which I won’t go into at length here, concerns an inner exploration of the mind of the VoiVod, touching on paranoia, schizophrenia and depression, Away’s explanations of the song themes including references to both external and internal subjects, such as “…privacy starts to fade when you are scrutinized by your own mirror image” (‘X-Ray Mirror’), “The logic dripping into a cuboid (cubic) upside-down cell” (‘Into My Hyper-cube’) and “The frustration of a character trying to find his way out of a synchro-freeze state” (‘Nothing-face’). Concepts are often the last refuge of bands struggling to find some easy hook to hang weak music around. They can be clumsy, ill-conceived or even laughable. In the wrong hands they can be ludicrous (witness the inane ‘piracy’ motif of Running Wild or anything at all by Warfare). Yet VoiVod enjoy a rare respect for their use of concept. Their inteligence sets them aside from the mass. When the band talk of VoiVod warriors, post-nuclear scenarios and alternate dimensions, you don’t feel the need to enjoy a cheap laugh at their expense. Their Sci-Fi angles are closer to Arthur C. Clarke or Issac Asimov than any cheap pulp sensationalism. That VoiVod have chosen to cover a Pink Floyd track on the album says more about the band than any words could. That they’ve chosen ‘Astronomy Domine’, a track from the Floyd’s early Syd Barrett era, rather than something from Roger Waters’ angst ridden world reveals even more. Some would say Barrett was a genius. In 1989 he’s almost certainly a mad man. After consuming several drugs too many during his time with the Floyd, Barrett’s now a virtual recluse and burned out acid casualty. Yet he still commands a worldwide underground cult following. For people like VoiVod, Barrett will always remain a man with vision. Despite their own huge underground metal following, VoiVod’s terms of reference have always been much broader. Their metal twists and turns, an experiment in psychedelia, an experiment in industrial noise, mutant music for a mutant future. The album’s got probably the best recorded sound you’ve ever had. How does this album stand in relation the over-all scheme of VoiVod? Can you eventually see the band dropping the concept all together and working in a more direct manner? Have the band started gigging since ‘Nothing Face’ was completed? 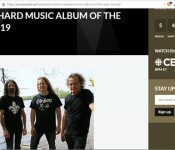 Are you integrating into any kind of Canadian music scene or are you still outsiders? You’re making a video for ‘Astronomy Domine’, aren’t you? I’m sure VoiVod would be capable of making an excellent extended concept video of album length. Could this happen in the future? Now that you’re working with a major label, do you think you can expand on your following, or is your music just to inaccessible for most people? Are your budgets a strain to work on? Well, it makes a change from bands who hated their day jobs (see Faith No More feature elsewhere this issue). 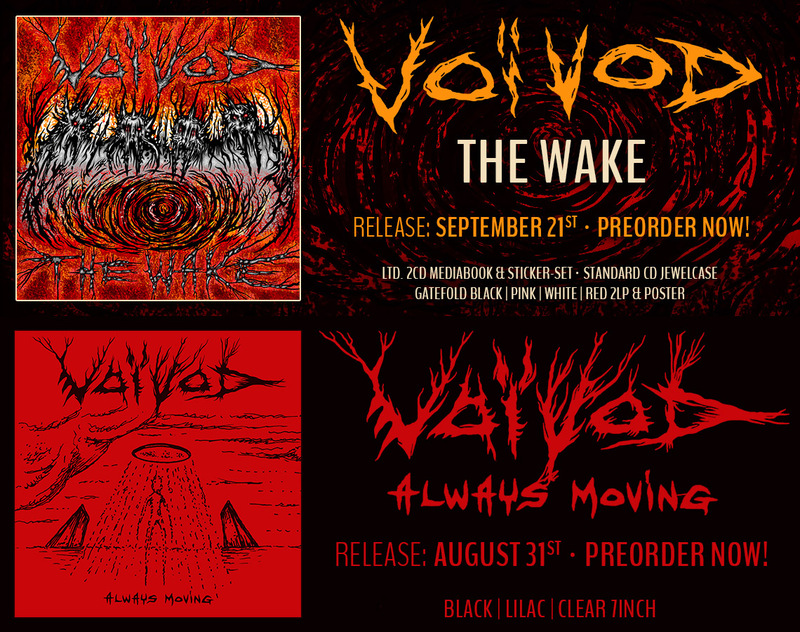 While many of the bands who emerged at the same time as VoiVod are now running out of steam, or ideas, ‘Nothingface’ proves that this is one band with a future.